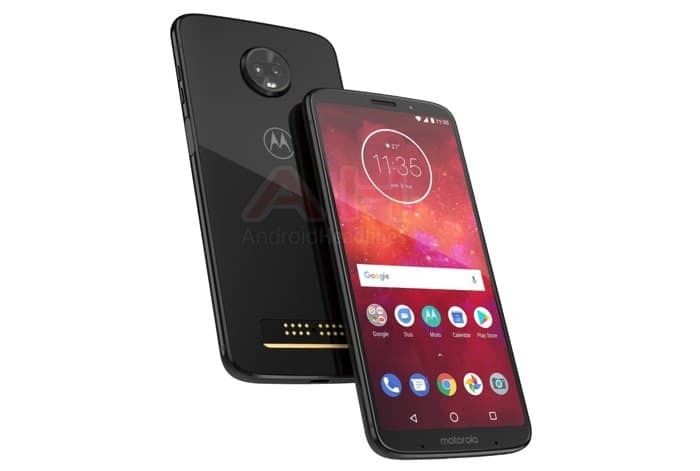 Motorola recently launched their new Moto G6 and Moto E5 smartphones, now we have details about another device, the new Moto Z3 Play. The picture above is an official press render of the new Z3 Play smartphone that was obtained by the guys over at Android Headlines. The handset is rumored to come with a 6 inch display with a FHD+ resolution and it will feature an 18:9 aspect ratio. The handset will apparently be powered by a Qualcomm Snapdragon 636 mobile processor and it will also come with 4GB of RAM and 64GB of storage. Other rumored specifications on the handset include a 5 megapixel camera on the front for Selfies and a 3000 mAh battery. The device will apparently also come with a microSD card slot foe extra storage. Unfortunately those are the only details we have on the new Motorola Moto Z3 Play so far, the handset is expected to come with Android 8.1 Oreo. As soon as we get some more details about the device, we will let you guys know.